Climbing Zugspitze was a great challenge for me because of the manner I did it. With 2962 m, this is the highest German point. It is very close to the famous tourist resort Garmisch-Partenkirchen, and the mountain is very visited by tourist. In this text, I describe for you the normal route which goes over a glacier, and you will find all information which you need. This is the first-hand information, I climbed the route myself. Zugspitze is an impressive mountain and normal routes are breathtaking. I would say only the summit itself is rather disappointing. When you get there you will mix with tourists having lunch and drinking beer, and you will not feel anything of the atmosphere a real mountain summit normally offers, like moments of solitude and silence, and pure joy of being so close to nature. 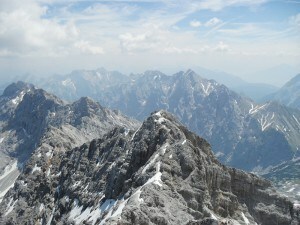 Zugspitze as seen from the summit of Schwartzkopf. Ski lifts are there, even a railroad; yes, you are reading this correctly. According to Wikipedia, about half a million of people visit the mountain every year. What you lack on the summit you may enjoy on your way up. There are two normal climbing routes, the south route from Reintal and the north-east route from Höllental (this latter means Hell valley). I did not pass the Reintal route, but what I know about it is that in summer time it requires only a basic walking gear. There are two huts on that route, Reintalangerhutte (1.366 m), and Knorrhütte (2052 m). Far more attractive appears to be the Höllental route. You will start from Hammersbach, a village at around 750 meters above the sea. 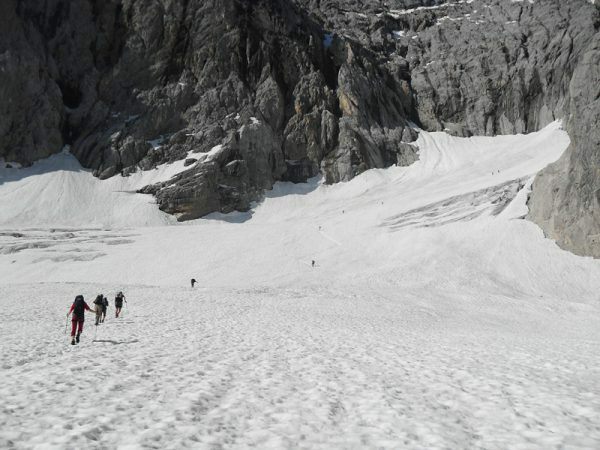 This route includes all you may wish to experience, walk through man-made tunnels, a long glacier walk, several lengthy ferratas, rock scramble, there may be icy areas along ferrata sections. There is also a mountain hut Höllentalangerhutte (1379 m) on the way up, and most of the climbers spend a night there. You will have to pay an entrance fee (3 Euro in 2010) at the gate in Hoellentalklamm which is at around one hour walk from Hammersbach. 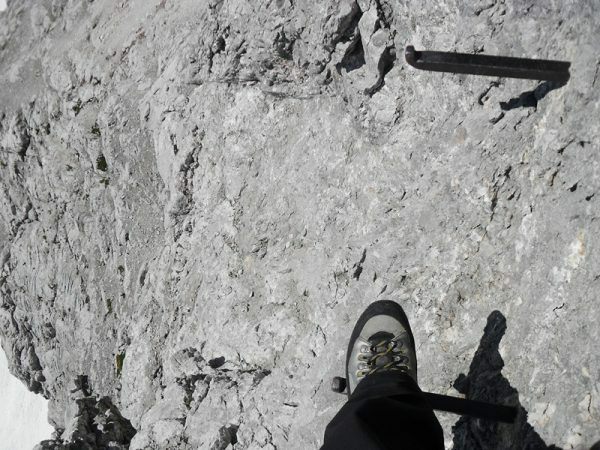 The first ferrata on the route to Zugspitze. Steep section on Zugspitze route. Climbers on the route to Zugspitze. Glacier on the route to Zugspitze. 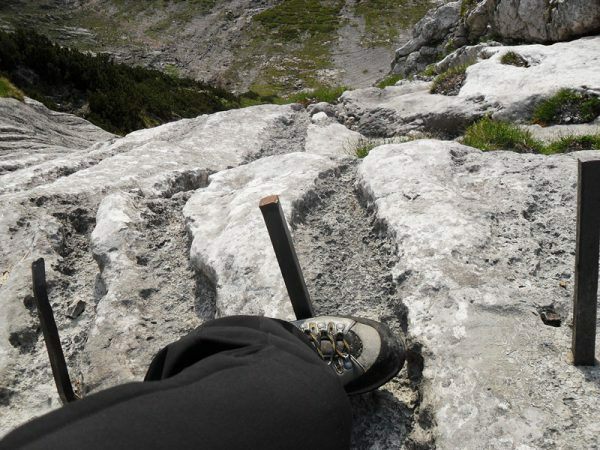 Mountaineering boots which support crampons. For me, this was a solo climb, in 2010. I was driving for many hours from Belgium and climbed the mountain without sleeping. My starting point was the car parking at Kreuzeckbahn lift station where I arrived after 2 a.m. From there I set off at 3:30 a.m., and walked along some small road toward Hammersbach. After that, I continued to Höllentalklamm. So my starting point was at around 750 m above the sea, and I had to climb about 2200 meters of altitude. At the end of glacier part. View of the glacier route from the upper ferrata. Yes, this is the summit, with all comfort. This was hard. I was at Höllentalklamm at 4:30 a.m., and obviously, nobody was there to charge the entrance fee. Luckily the gate was not locked and I continued through many tunnels. 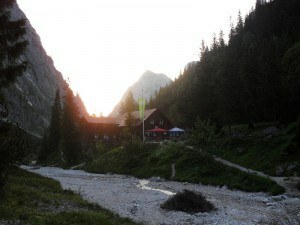 At 5:40, I was at Höllentalanger hut, so I just continued. It was on the first ferrata section where I met first people that morning, in fact, many of them who clearly spent the night in the hut and now there was a crowd there. It takes a time to put a harness, prepare a Y-rope and attach yourself to the cables, so there was a crowd there. After two ferratas, a long glacier walk followed, where I used crampons. The glacier part ends up in a steep rock again from where you will pass several sections with cables. This remains so practically to the summit. At several sections, the steel cable was in the ice so it was a bit tricky to attach my carabiners. Höllental (Hell valley) – a very inappropriate name. View from the summit. The route was rather crowded. I noticed one person was climbing without a Y-rope and harness. He was moving fast and was obviously bored waiting for his wife whose progress was slow because of a continuous process of attaching and detaching of carabiners to the cable. I would not recommend anybody going without a Y-rope, see the photos and you will realize why. I was at the summit at 12:15. This long climb directly from the valley, I did in 8 hours and 45 minutes. I was exhausted, the day was rather hot. I used 3 liters of water for the ascent. 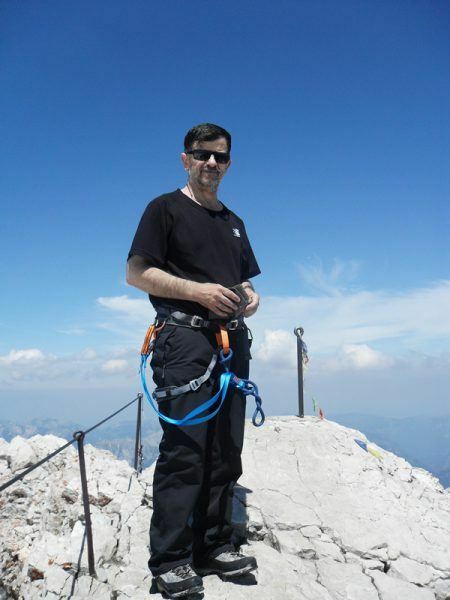 Me proudly on the Zugspitze summit. Jubiläumsgrat Ridge route connecting Alpspitze with Zugspitze. 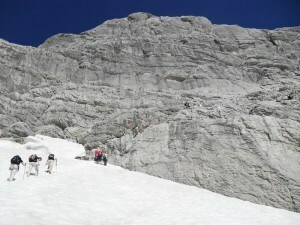 The summit was full of climbers, and also with many tourists. They were constantly coming by the cable-car from Eibsee far below on the north side of the mountain. If you look for accommodation, this is not a problem in principle. But Garmisch-Partenkirchen is a popular destination so book something in advance. I suggest you visiting my post with information about agencies I usually use for accommodation. To summarize, this is an attractive climbing tour, and I am sure you will enjoy it. If you have problems with vertigo better not go that way, use the other normal route mentioned above, it is more lengthy perhaps but far different. I hope you enjoyed the text, and if you find it useful please share it with others. Please leave your comments below. I shall appreciate any suggestion for the improvement of the site. So much wonderful information! I want to hike the Zugspitze and I have 1 year to prepare. Any training suggestions for a novice? Hi Brittany, thank you for the kind words. I do not think you need that much to prepare for Zugspitze, anybody in normal physical conditions can do this. You will need ferrata equipment (at least harness and a Y-rope with carabiners). Note, I would not use the word hike. You have seen the pictures, the cliffs are very steep. I did the Zugspitze by the Hollental route in early October 2018. I am 63 years old and have good stamina but go very slowly in the mountains now, and I really notice the altitude above about 2000M. The weather was perfect. I stayed at the Hollentalangerhutte, looking back this was a mistake. I did not get much sleep – it was so noisy all night due to people closing doors when they visited the toilet. Because I have a slow pace I wanted to leave the hut at 5 but they did not serve breakfast until 7. I did not leave until 8 which was too late. I should have carried lightweight bivouac gear and a small stove and bivouacked on the glacial moraine where there are several flat spots. This would have given me plenty of time. The glacier was icy and my crampons were essential. I got to the summit 15 minutes before the last train because I was not adapted to the altitude and was going so slowly. Looking back – it is a really beautiful route and I plan to do it again next year, but next time I will bivouac instead of staying at the hut. It is so great to read your report Christopher. I understand you well about the hut, I love huts but cannot sleep there so it always as you experienced, a sleepless night. There is one person who commented here who was sleeping outside below the first ferrata. This about the altitude effects is totally unpredictable, sometimes I have it also at low altitudes, but acclimatization helps. Interesting that you did not have fresh snow, I was in Slovenian Alps in September and passing through Austria the peaks were under fresh snow. I agree about the route, breathtaking. Thank you again, let us know if you go again. Thanks for your post. I used it for most of my research and today have successfully climbed to the top of the Zugspitze via the Höllentalanger Hutte. Amazing! Considering less than 3.5 years ago I’d never put foot to rock and I’m over 50 I’m so proud of my achievement! 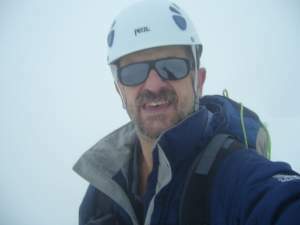 A number of first for me today – first solo summit over 2500m, first led via Ferrata, first glacier crossing. I am glad that I found your site! I am planning a trip to see Zugspitze in early/mid May of this year. Perhaps I will satisfy my hiking urges on other mountains. Despite the presence of the Reintal, I fear that I may not have access to all of the gear I will need to complete (or bail) on the summit safely. To this end, do you have recommendations for other mountains in this area or other areas of Germany that I could attempt to summit? For fear of listing a resume, I will mention that I have successfully peaked Mt. Katahdin, Mt. Washington, Mt. Mansfield, and Mt. Marcy of the US (first three are within the Appalachian Train) during summer conditions. I have had successful summits in winter conditions but these peaks were approximately 1500m in elevation change. Hi Tyler, great to read your lines. The Alps are still covered by deep snow. I just checked some web cameras in that area. The problem is those are sharp mountains where you would follow some ferrata sections and those might be in ice and snow so you cannot find them. In this case there is no way to go to Zugspitze. Several years ago I was there in the second half of May, and know for sure that Hollental valley was closed so it is not possible to enter and it is not advisable even if you manage. You can try Reintal and see how far you can go, you can rent equipment in Garmisch or buy it, there are many shops. But in general, this is too early. 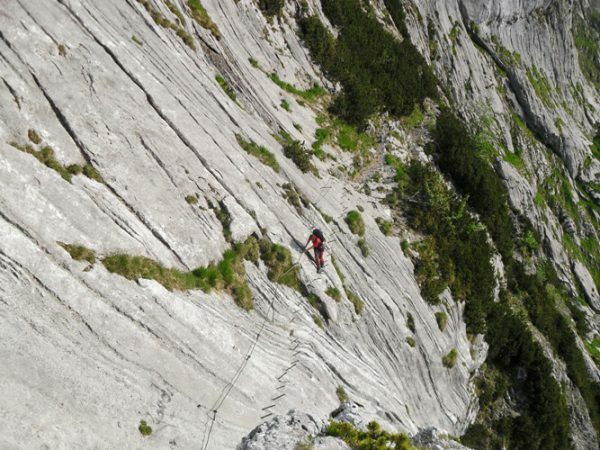 In the episode I mentioned, I tried Alpspitze and had to give up, could not find the route, it was under snow and I did not see ferrata cables. So I walked up the Kramerspitz instead. Perhaps you can try some even higher mountains in Austria, but those that are not sharp. The distances are not big once you get there. For example Similaun might be doable if the snow is not deep. I am not sure if Similaun hut is open (or Busch hut), it would be too long to walk all the way from Vent. WN Apline in Garmisch rents gear, there were awesome to deal with. Many thanks Cris, this is a really valuable information, I shall bear it in mind if anybody asks. Hello! I previously climbed this route in August of 2015. Great view and great experience. My question is do you think a climb would be practical in May at the beginning of the season? There has not been much snow fall in Bavaria this year and want to get some outside opinions. Hi Ricky, sorry for my slow reply, I am in mountains right now and do not have regular Internet access. At this moment the Alps are under snow, above 2500 meters or so you have total winter conditions. I wanted to go to the Austrian Alps and had to change plans so went to Slovenia. Here the mountains are lower but still, it is very hard to get to any summit. I spent two nights at Vrsic pass and could see small avalanches from Prisojnik mountains all the time, so it is not safe, tried from the south side but still could not find the route, all is under snow. For this particular Zugspitze climb, I would expect cables to be under snow at many places and perhaps also in ice. So, I would not go there so early in the season. Do you know if you can rent a harness and Y-rope anywhere near the start at Hammersbach? In Hammersbach definitely not, this is a small village with just a few houses. In Garmisch they have several good outdoor shops, I have been there, but I do not know if they rent stuff. I just searched in Google with “renting outdoor equipment Garmisch Partenkirchen” and it seems it is possible to check online. Found this post when I was researching for a European mountain to climb and was totally inspired by this post! Would this be possible to do around week 3-4 of December this year? Also, I recently climbed Mt. Rinjani a few weeks ago so if you’re ever around the Southeast Asia region I highly recommend this! Hi Hafezah, many thanks for kind words and I shall bear in mind Mt. Rinjani, grateful for this. As for climbing Zugspitze in the beginning of December, I think I would not go but this may depend on the weather. Normally at this period of the year, the mountain is under snow, and if this is so, definitely do not plan to go. First, there is a formal reason, there is a gate at the entrance to the gorge, and I am pretty sure it is closed, and with good reasons. Second, if it is under snow, the cables may be covered in the snow and ice. 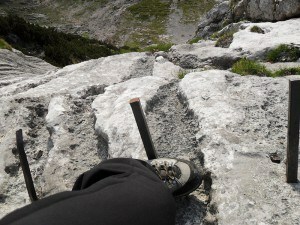 I had ice at some places along the ferrata sections even in July. So it can happen that you cannot attach yourself to the cables and in this case it is very dangerous. You know, these Alps are lower than Swiss Alps, but it may be far more complicated to climb here than to go over 4000 meters in the Swiss Alps. This is because they are so sharp and steep. There is also a danger of avalanche. There is Kramerspitz across the valley, it is lower and if there is no snow you can do it, the mountain is beautiful. Distances are small there, so if you are in the area, you can try something else, but if the mountains are under snow, do not go in any case. You might consider some mountains in the Italian Alps and Austrian Alps. Would you recommend hiking Zugspitze as a solo day-hiker around October 20th? Do you think it will be too cold or icy since the tours will have stopped for the winter? Are there routs you would recommend at this time for a novice mountainer hiker? Thank you for your time and sharing your experience! Hi Hannah. One thing to check is snow situation on this particular route. If there is no snow it is surely doable, otherwise no. Additional thing to check is the gate above Hammersbach village. At the end of season it is closed and you cannot pass. But if you are a novice then I do not recommend you to do this route solo in any case. You have glacier, ferrata, and rock scramble, so some equipment is needed and you should know how to use it. I warmly recommend Kramerspitz, it is just on the other side of the Garmisch valley. This is a beautiful tour, you can traverse the mountain and you will enjoy. Another option is the nearby Alpspitze, but again only if there is no snow. There is one route through the tunnels under the north face which you can do without any equipment. Hi James. I do not think it is doable. 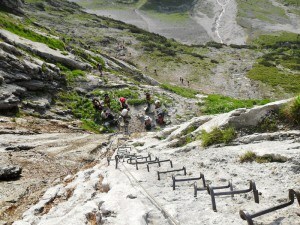 This is a ferrata route at many sections and cables will be in ice and snow. They were in ice at some places even when I climbed it, in the summer time. I have just done the Reintal route (3rd/4th October). It is not difficult but it is very long. It took me and my companion from 5 in the morning starting from Garmish and going through the Partnachklamm gorge until about 14:00 to reach the Sonn Alpin plateau beneath the last pitch up to the summit. We stopped for breakfast in the valley and lunch at the Knorrhutte. This was very slow but nevertheless we could have made the top if I had been fitter and just a bit quicker. In the end we took the cable car to the top, luckily got a bunk in the Munchenhaus and came back down and did the final pitch the next day. Weather was great on the Saturday and we had light snow on the Sunday morning. The last pitch is via ferrata but there’s no need in my view to have equipment – just a good gloves and a firm grip – it’s not really that exposed except in a couple of places but caution is still required. You need to check the weather carefully as the last pitch can become difficult if it has snowed a lot and a novice shouldn’t attempt this alone in my view – get the cable car instead. Note the last cable car down to Eibsee is 16:15 – you can’t book or rely on getting a bed at the top although there is always emergency refuge there. All my own opinion – do your own research and check the weather – it can change rapidly! If in doubt – bail out! Thank you John, this is very valuable first hand information. Much appreciated. I wanted to share with you and your readers some personal info of my climb regarding the glacier, and that is that crampons where not optional in my case. Of course the glacier and weather is ever changing and I read in many places that crampons are in fact optional, but when I climbed (4rth of September, 2016) it was impossible to do without them. As opposed to what I see in your pictures, now there was large part of it that was pure ice, and didn’t have that white, mushier ice/snow where you can create a step for the boot (and I had very hard sole boots). After many failed attempts, I was forced to go around the big crevices and find my way around it, which after seeing the glacier from above I wouldn’t have done, I slipped many times and could have ended not so fun hehe. Regardless of that, it was an amazing climb, not very crowded (minus the summit of course…) and excellent weather! Hey Rafa, so great to hear from you. Incredible how the glacier looks in your photo, all crevasses open and no snow. Great that you managed. How come that crampons did not work? No traction? I assume you had the usual 12 points steel. Did you stay in the hut? You said it was a two-days tour. I also just came from the Alps, climbed Hochfeiler, Tresero and a few more, and indeed so late in the season it is far less snow everywhere as compared to July for example. I did not have crampons, that was the issue as the ice was imposible to climb without them. The hike was prepared on a rush and since I heard from many people that they where optional, I went anyways without them. Once at the base of the glacier, after many attempts, it was either surround the big crevices area or go back, so I walk arround the crevices as though still icy, there was a thin layer of small rocks that gave me enough grip. Once up the via ferrata though, I saw that if I had fall down and slipped down, I would end up in the cracks further down. I didnt saw them from ground level. I didn’t stay in the hut, I set up my tent at night close to the base of the first via ferrata and start ascending arround 6.15, luckily there was some people but not crowded at all. Zugzpitze became immediately one of the best hikes I’ve made. My idea was also to do the Jubileumsgrat but decided to take it easy on the way up (the day was incredibly clear) and leave the rest for another time. I will take a look at those hikes you mention and be looking forward for their posts! OK, I misunderstood about crampons. Pity you did not have them. When there is snow, indeed one can manage without crampons, though I had them. So this was a great adventure, you camped there. My husband and I are planning on visiting Garmish in early Nov for a second honeymoon and we want to hike to the top of Zugspitze. We live in the southwest in the US so we have mountains but it is a desert environmentn(no snow). How hard would the Reintal route be in November? Enough for average hikers? We are in our late twenties and in good shape. Would we need any special equipment to do this route? I am concerned about ice and avalanches. We plan on bringing hiking poles but will we need crampons? My husband is a bit hard headed and I do not want him to overestimate his ability compared to mother nature and climbing conditions. Hi Caitlin. Thank you, great to hear from you. I did not pass the Reintal route so really cannot say much. You will be there in any case, so you will be able to estimate and ask locally. I like your point of view, mother Nature is always stronger, competing is pointless. If it is under snow, I would not recommend you to go my route in any case; as for the Reintal cannot say much but my advice would be against going. If it is without snow then definitely do not miss it. I believe even for Reintal you would need harness and Y-rope, but I am not sure. Crampons are not needed (but again, I assume it without snow). Do not miss Kramerspitze if it is without snow. You can traverse the mountain. See my reply to Hannah in the thread above. The only additional comment is that November is getting late in the season in my view for this and you may find some facilities not open or restricted – the Munchenhaus for instance. Be prepared for bad weather and if is raining in the valley coming out of Garmish then it will be likely snowing from the Knorrhutte and up. Be wary of attempting the top pitch if there is a lot of snow unless you are competent and not just confident. Having done it “dry” I don’t think that crampons and harness would be necessary but caution is definitely needed in snow. It took us about 1.5 hours for this pitch – in snow it would be longer so allow time to get the last cable car down from the top. Do your own reaseach and if in doubt – bail out. Good luck! Once again John, very useful information. Many thanks. Hi Jovo, I was inspired by your own useful posts… Do Hannah or Caitlan get notified there is a response to their own post by the way? Actually you motivated me to try the other route, I might do it next season. Not sure if they have some notification system in place. Really awesome posts, very helpful. But just one question – how long does it take to climb up and down ? Because I don’t want to pay anything for accomodations, I would rather try to climb to the top and down in one day. Is that durrable ? How much time did it take for you ? Hi Mattis, all three normal routes can be used as descend routes as well. The shortest way is Hammersbach route. More easy and far more lengthy is the Reintal route. Timing will depend on you. It is doable but very hard. I am totally ashamed to say, but I used the lift back. This is something I did only 2 times in my all 30 years of climbing mountains and cannot forgive myself. Reason: I needed to be on Marmolada’s Fedaia pass the same night and I realized I was exhausted too much because I did not sleep at all the night before, was driving directly from Belgium and started climbing immediately. So this was my fault, brought myself to my limits. I am glad that there are people like you, purists, this is the only way. You can read my story about Marmolada which I did next day. Thanks so much for this website and information. This is the most helpful website I have been able to find about a solo ascent to the Zugspitze. I am from Mexico, and I am planning a solo ascent to the Zugspitze at the end of June 2016, I am a mountain climber, and I have been climbing mountains for more than 3 years in diferent countries. And I would like to know your suggestions. Hi Julio, great to hear from you. No problem, I shall be happy to give you any extra information. You have seen my text, so this is a ferrata route, you will thus need a climbing harness and Y-rope. I have seen some people without crampons, but this is rather early in season so I would rather have them, you will cross a glacier in any case. Let me know what you need and I shall try to answer. Thanks for your quick response. I would like to ask you some questions, I reserved a room in Oberammergau, so could you please help me to plan my ascent to the Zugspitze from there, what time do you suggest to start? if I am planning the same route that you took. Do I need head torch: LED headtorch (Petzl), rope, map, compass & GPS? You will have to drive to Hammerschach. There is a parking at the entrance to the village, with payment. As for the start you have it described in my text, it depends what your plans are. In the Alps the weather is always more stable in the morning so I always go very early. Yes you will need a torch if you go so early, there are tunnels to pass but there is light there. No rope, you need Y-lanyard, see it here. I always have map, compass will not be necessary. I do not have GPS so cannot say anything about it. You can spend the night in the hut and start much later next morning. Good luck on your climb Julio! 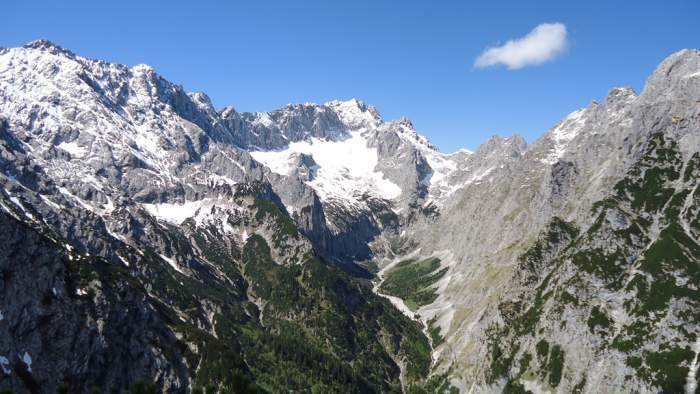 Our team will be climbing Zugspitze 30 June – 1 July! Hey Mal, good luck out there, it will be great to hear a few words about the climb. Hello Jovo. First of all congrats on the website, it´s incredible helpful (also the gear section). I have a couple of questions if you don´t mind. I am planing a two day trip to climb the Zugspitze and then do the Jubiläumsgrat to Alpspitse. Since I will be living in Munich I was planning on leaving Munich early in the morning and climb up the Zugspitze in the first day, stay at the summit and then early next morning hike the rest of the plan. I´ve seen in your diary and most of others I´ve found, that everybody starts super early. Is this just because is a day trip or is there any other reason I should be aware of? Also, I was thinking about late June 2016 to try and avoid some of the crowds you mention, do you know how the conditions might be in the Jubiläumsgrat regarding snow and ice? (without considering the rain that I know is unpredictable). Hi Rafa, great to hear from you. I climb sometimes overnight, without sleeping, just to be on the summit for sunrise, but in most cases this is so because weather can change dramatically in the afternoon, this is typical for the Alps, it is usually more stable overnight and in the morning. I have experienced it many times in the Alps, and you will as well. But for Zugspitze it was because I knew it would be a long tour (I started directly from the valley). People who were staying in the hut obviously started many hours later. You say you would stay on the summit overnight, I do not know if they have some accommodation, there are many things on the summit, but perhaps you will be carrying sleeping stuff. When I climbed Alpspitze last summer, I met a couple who spent the night on the summit of Alpsitze (you can see them in the picture here), so this is also one option for you, you can climb the Jubiläumsgrat in the opposite direction as well. They said condensation was strong in a part of the night, so all became wet. Late June may be too early. I do not know Jubiläumsgrat because did not pass it, I have seen it from both ends, very rugged and hard. But some cables on the ferrata to Zugspitze were still in ice and I was climbing in July, though it was doable, no problem. As for coming directly from Munich, yes this is doable, you can do it that way. All the best, and thank you for kind words. Thanks again Jovo, this time for the quick response. I thought there was accommodation at Zugspitze summit, I see now that I was wrong! I do prefer camping, and no that you mentioned it, I wanted to ask you about that. I lived in Austria for a while and they warned me against camping on my own, outside from camp areas (which where 99% of the time at the trek starting point…) because of the law (not because of safety). Does this still apply in Germany or a mountain like Zugspitze? I´ve done it many times (mainly in Southern Patagonia) which is far less crowded, and of course I know it will be my responsibility as of safety and that I have to leave zero trace in the mountain (which I think always applies), but I don´t know how are things in Germany? Hi Rafa, you will see many areas where it is said camping prohibited. But I love to think about this in my way. Nobody owns mountains, and nobody can love and respect them more than me, so no one has right to put such obstacles in front of me. So I go where I want and stay where I want. In more practical terms, I think it is accepted that over-nighting is OK, in particular if it is at high altitudes and not in the close vicinity of a hut (in such cases you ask for permission from the hut guardian), this means putting the tent after sunset and picking it up early in the morning, no harm is done. I understand camping as setting the tent during the day or for several days. I believe in Austria and Germany they may be more strict than in Switzerland, just my feeling. 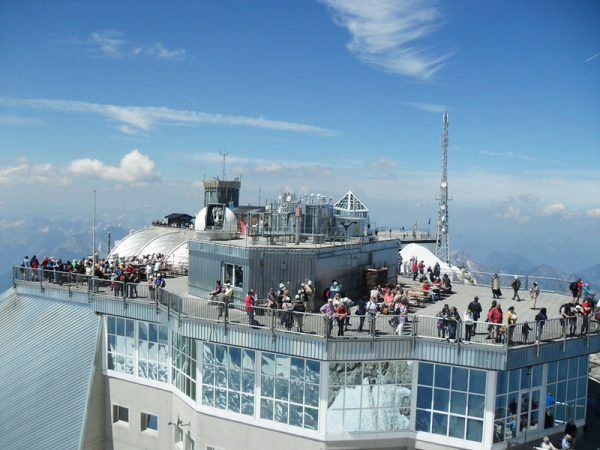 As for Zugspitze, do check about possible accommodation on the summit, this is very possible, there are so many things there, train station, lift station, restaurants. I just did not check so cannot say anything. Excellent, couldn’t agree more with the way you think about the mountains. Thanks and all the best! Great music on your site. My wife and I want to do the same thing this August. We would like to hire a private guide to take us up and help arrange perhaps staying the in hut overnight. I am sure advance reservations are necessary. Do you know anyone willing and qualified to take us up or can you recommend a guide service there. I am 76 and my wife is 66 ( I married a child bride.). But we are not hopeless. We have a fair amount of climbing experience. Hi David, great to hear from you. I did not stay in the hut but definitely it is necessary to make a reservation, this is a popular area and people go there even without continuing to the mountain. I do not know guides there, but I do not think you need any. 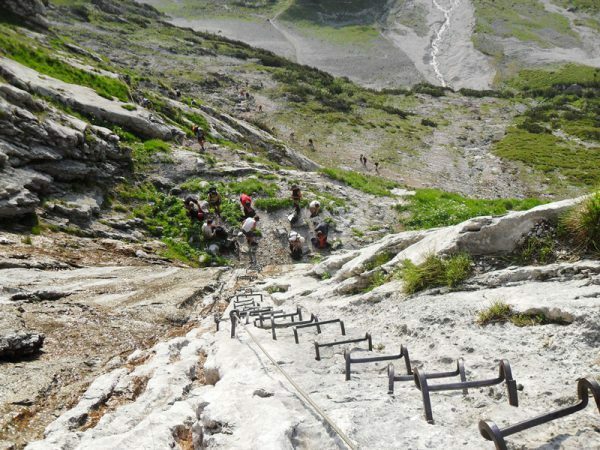 You have experience so you will manage it, the route is always obvious because it is mostly ferrata, and there are many people going the same way. So you need harness and Y-rope. I have seen people without crampons. If you have time you might climb Alpspitze as well, the route I passed is ferrata only in a small section. If I may add, I am impressed, I can only hope I shall be able to climb at your age. I wish you a safe climb and good weather, it was perfect when I was there. Love the topic. Really makes me want to mountain climb as well. Great job, I will keep up with this site to follow your adventures. Thank you Nick, great that you like my post. This means a lot to me. All the best. I am an experienced climber and have a day off from a business trip on which I would like to climb the Zugspitze and would like to take the Höllentalklamm route if weather permits on Nov 20. Like you, I would start early morning -5 am, despite the cold. I have estimated the climb will take me about 6 hours. But I have read that the gate to the canyon is closed for the season. Does this mean there is no access to the route you took even if there has been very little snow? If so, what would be the next best route? Hi Thomas, great to hear from you. Please check the snow conditions before you go. The route has many ferrata sections and cables can be in ice so perhaps you would not be able to attach yourself at some very exposed places. I was there in summer and still there were a couple of places where it was a bit hard to get to the cable. Frankly, I do not think it is a good idea to go. If the gate is closed then there must be a good reason. About gate. When I passed it was dark so I did not make any photo and cannot send you. But it is made so that it looks impossible to pass when it is closed. However, I have a colleague who was there once in May, the gate was closed and he says he made it over the fence. If you wish I might try to get in touch with him, and ask. There is another Reintal route which I mentioned in the text, I know for sure that it is far less complicated, but I did not pass it and cannot say anything. It is supposed to be a walk up, but as you know it is enough to have one place with ice or snow to ruin all the trip. If there is no snow then you can do Alpspitze the way I did. In case of snow it is not doable from that side, but perhaps from Reintal direction it can be done. I was there once in late May, tried the Schongange route and failed because of snow. 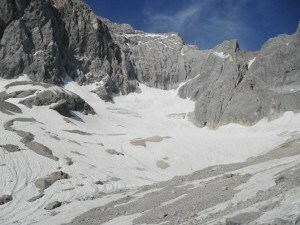 North ferratas were not possible, there were critical places with snow. So be careful and best luck. Thanks very much for the information, I’ll watch the weather over the next few days and keep gathering information – but would like to hear any experience about the closed gate. I’ll study the Reintal route as well. What made the cables difficult to clip? Were the cables stuck to the wall? or covered with frost, ice or snow? Are the cables likely to be in the shade? I shall send an email to my colleague, and I shall let you know if I hear anything. The cables were in the ice at a few places in the upper ferrata. They are normally close to the rock, so ice is formed around them easily. No, they are practically never in the shade, it is just high altitude. this website is what i really looking for. my name Ashyafat from Indonesia. i am planning to go to Germany on December for a family vacation. only me in my family that love to do outdoor activity. anyway, we are planning to stay in Munich and I am planning to make an extra agenda to climb Zugspitze myself. 1. is it ok to climb on December? i recognize that it will be Winter. 2. if no.1 is not OK, then is there any mountain that is safe enough to climb in the winter? i’ve never experience snowy winter in the mountain before, so i need your advice. Hi Ashyafat, thank you for visiting my site. I am rather sure that climbing in the Alps in winter time is quite impossible. Sorry to disappoint you. The snow is usually deep and you cannot walk. 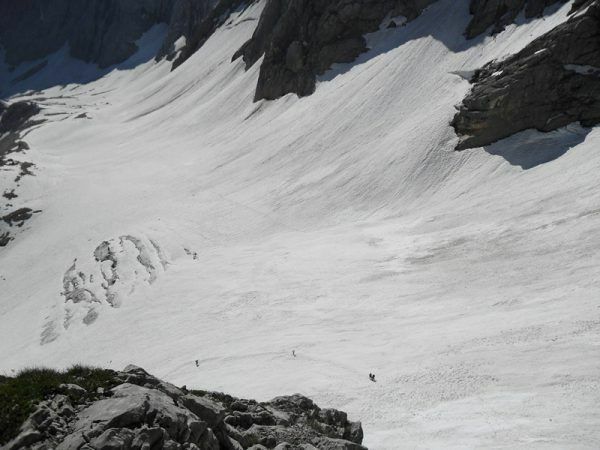 If it is ferrata like Zugspitze then cables will be in ice. Using snow shoes or skis is one option but this is only for some mountains. I do not think Zugzspitze can be one of them. i believe i should do snowboarding/ skiing instead? can you recommend any place? All the area around Zugspitze is popular for skiing, you cannot miss it. Ski lifts are everywhere around Garmisch Partenkirchen. What an adventure must that have been! When I read you article, see the pictures, It really has to be breath taken at some moments. But I can imagine that you cannot do this without a decent preparation, training and a good condition? And the music you provide during the reading is the finishing touch! Hi Bert, many thanks for such a great comment, it is much appreciated. I usually try to be well informed when I go to some mountain. So my own texts are written to give information to those who need it. It is essential to know what you can expect, people get killed at such places. So photos play a big role in this. Thank you again. Hi there! That’s a nice post about climbing Zugspitze which you have created here. Thank you for the comment Kush and for visiting my site. I am happy that you find it useful and good. Best luck to you too. Great post. I am traveling to Munich for work in October and am really wanting to make the climb. I have a few questions. 1. I would be going on October 17th, are you familiar with the weather then, would it be to late to do the climb? 2. I am an experienced hiker and done via ferrata before, so I am not worried about the technical difficulty. But is the route pretty clearly marked and straight forward for someone who does not read/speak German? 3. If going on a Saturday would you anticipate I would be around other climbers? Thanks again for the post and look forward to your response. Thank you for visiting my site. Here are my answers to your specific questions. 1. I think you might be able to climb unless the weather turns really bad and brings the snow too early. If it is under fresh snow you surely should not go the ferrata route. I would then try the south side approach mentioned in my text. But I did not pass that route and cannot say more. 2. Yes, no worry to find the route. 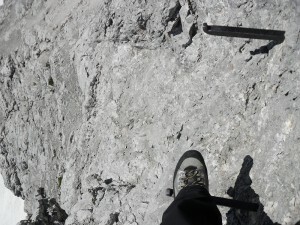 It is properly marked, and ferrata was in good conditions, German-made so what else to expect. You may follow the route by following the description from my text. 3. Yes, you will have many people around (if the weather is good of course, otherwise do not go). I was there in August and climbed the nearby Alpspitze (have a look in my site) and there were literally hundreds of people on the north Alpspitze wall. The same you may expect for Zugspitze. If you cannot climb Zugspitze, you might enjoy Kramerspitz, this is a real pleasant mountaineering tour. There are some web cameras available for the area so you can see the situation any time live. This site is very informative for those like me for whom mountaineering is a totally new subject and for those that are experienced. Your photographs are breathtaking, helping one to imagine what it would be like to be there. Your music insert is also very interesting and helps to transport ones mind to the various ranges. When I viewed your page there was a big space right after the “Zugspitze seen from Schwarzenkopf” picture, not sure if that was by design or MY browser, or what. I’m glad to have seen your website…!!! Thank you Tim for visiting my site and for the comment. I am going to check about photo which you could not see. Probably slow upload. I am happy that you enjoyed the text. Great article about climbing Zugspitze and I would have to say I understand your comment about once you reach the summit and all the people their from cable car take away from the solitude of a successful climb. To me its like a double edge sword where its great about being one with nature and doing the climb with the accomplishment you achieve once at the summit. On the other hand I was also that guy taking the ski lift up to the top just to ski down not appreciating the journey to reach the top under my own power or cable car to check out the views. Thank you for the comment Travis. I can see your point of view and can appreciate it. Perhaps I should modify my sentence in the text about Zugspitze. I needed to see people who experienced the mountains like me, not tourists. But mountains are indeed for everybody as the title of my site suggests. Thank you for visiting my site Dominic. Zugspitze is the highest German mountain, great place to visit. Hi Fidel, I mentioned in one sentence in the text, for this particular mountain better do not go if you have problem with vertigo. Those pictures of the mountains makes me want to go visit! It’s like a huge resort on the top. Climbing Zugspitze must have been a lot of fun, I can’t believe you went up solo. Well you said you met up with some people, did you climb with them? Thx for sharing your trip. Hi Richard, thank you for the comment. I climbed solo, but there were people on the route. Wow some of these pictures are quite amazing, you said you climbed this peak yourself – are any of these images from your camera perhaps? I also like the sound of the Hollental route that starts off at that high up village – the peace you get through this trail must be second to none. Hi Chris, do not understand what you mean by your question. Every single photo of mountains in all my site are my own. I do not borrow from the Internet. I stressed this explicitly in my page About this site. I write only from the first-hand experience. Thanks so much for this website and information. This is the most helpful website I have been able to find about climbing Zugspitze. I am a student from the states studying in Germany and would love to experience Zugspitze (without cable cars of course). I do not have much mountaineering experience, but I am very fit and love adventure. I climbed Carrauntoohil in Ireland a few weeks ago and would love to find something more challenging! I assume that going the Höllental route alone without experience would not be safe at all. But if you, or anyone reading this, knows of any guides that may take a group up the mountain, or really any advice at all, it would be very helpful! Unfortunately I will be heading back to the states at the end of June. But you said the South route would be doable? Or maybe there are other, smaller peaks in the area that would be good for day hikes? Sure there are many, see for example my story about Kramerspitz or Schwarenzkopf. Another option which I suggest is definitely Alpspitze but be sure that there is no snow. Thank you so much Jovo. You have been so incredibly helpful! I think I will do Kramerspitz. The pictures look beautiful! What month did you climb the Zugspitze. I am thinking about June and wonder if there will be to much snow? I climbed on July 2nd. The snow on glacier is not a problem. But at ferrata sections at some places the cable was in ice, although it was doable. So if you go that early you can be sure you will have ice on ferrata route. If you take another approach through Reintal you will have some snow but this should be just a walk, perhaps with crampons. Hello! I absolutely love your website! I always wanted to try climbing but I have developed a height phobia and I find it difficult to try such an activity. However they say the best way to fight a phobia is to dare to try what you are afraid of! I love your post! Very clean and informative and i love the photos you offer! Is the gear too expensive? That still looks pretty intense! When I was in younger I was a boy scout and loved to hike. I did hike several 100 mile treks as well as the Grand Canyon several times. I would love to hike something like Zugspitze. I think I would need some conditioning before I did it though. Thank you for the write up! Many thanks Marc for visiting my site. 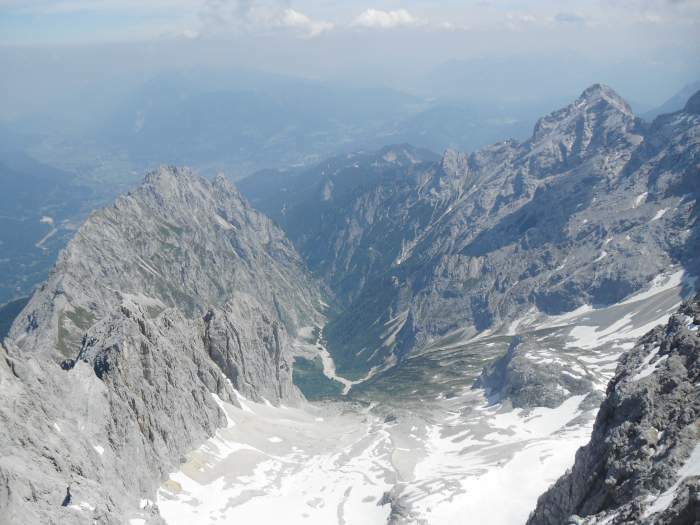 Hiking is not the best word to describe Zugspitze adventure, it is a hard ferrata plus glacier walk.